Once upon a time we had three chicks that grew into happy, fat chickens. One flew the coop, never to be seen again. One was killed by an unknown four-legged assailant. The last one, Henrietta, chattered and ran around the yard, living her carefree life, happy enough to peck and scratch and eat treats we brought out for her. Over the past few days, we noticed a change in her: she wasn’t running for treats, and mostly she was sitting under the palmettos or under the rack in the coop, not wandering the yard. Yesterday, she was panting and not moving much at all. Mom and I were out looking at the girls (since we added more chickens to keep her company the past two years) and a storm blew up. I gathered her up from under the palmettos since she wasn’t moving to get out of the storm and took her into the coop, then out of there to the back porch into a box lined with a towel. We knew she was on the way out, so we made her comfortable and kept an eye on her. Last night, she finally stopped breathing and this morning I buried her out on the edge of the property where I’ve buried two other chickens. So long, Henrietta. You were definitely the favored one amongst the girls. Lately I’ve been feeling pretty tired, all the time. With some B12 supplementing and some working outside in the sun once more, I’m now feeling a lot more like myself. Today I replaced three (of four) boards on various frames that needed to be repaired, fertilized some frames and worked that in to prep them for planting, replaced all my watering timers as the current set froze over the winter and then cracked (didn’t toss them, though – they still work, they just leak like hell which will be fine in areas like the orchard), planted the first round of sweet potatoes, reran some irrigation lines, and cooked some steaks, sauteed squash, and baked some potatoes for our dinner. I even managed to get some steak down, a major accomplishment. Oh, and I got the first sunburn of the season. Luckily with my heritage, by tomorrow it will be faded and I’ll be back to getting my farmer’s tan on. Tomorrow: beginning the tomato transplants, as they’re ready to come out of the flats, sunflower sowing, thinning some onion and leeks that were started in the front garden late last year for replanting to give them all some more room, and washing/sanitizing wine bottles and the fill bucket so I can bottle the rissling for storage, then beginning the honey weizen. Always something to be done at the ranch. Who is Sal, and does he or she know that there is property waiting for them? What’s most sad about this is that it has to be explained at all. Either people have gotten moronic over the years or it’s just more noticeable now that we’re in the Internet age. In other news, a ton of weeding done in the back garden: five and a half rows done before my back decided it was time to stop. But there may be sowing of seed yet today after a little break. What is this – Saturn? I don’t think this wind speed is quite accurate here. Don’t get me wrong, it is pretty windy outside. It just isn’t that windy – yours truly would have been blown three states away, were it. Instead I dug out eleven holes, backfilled them a bit with topsoil and cow poop hauled by wheelbarrow, put in two raspberries and nine blackberries, topped them off, ran irrigation to them, and watered them in for half an hour. I also filled four bins with mulch for my sister, who is redoing her firepit area at her new place. For the first real day back at working ranch stuff, not bad, although my back started seizing up at the end and the random throws I was making for the puppy, whose orange ball is his number one prized possession was giving me some fairly savage stabbing pains down my side. But: stuff got done. That’s what matters, in the end. With any luck, my back will loosen up just a bit and I’ll be able to get back outside to do something else as we make steps to ready for spring. One thing at a time. One week into clarifying, and we’re making progress. The clearing continues from the top down. Another week or so, and we should be ready for bottling and aging. Since we’re into spring here in Florida, we’ll be picking up some strawberries (local!) and getting started on some strawberry wine by request. Wine, that is. This evening is the final stage before bottling: stabilizing and clearing. 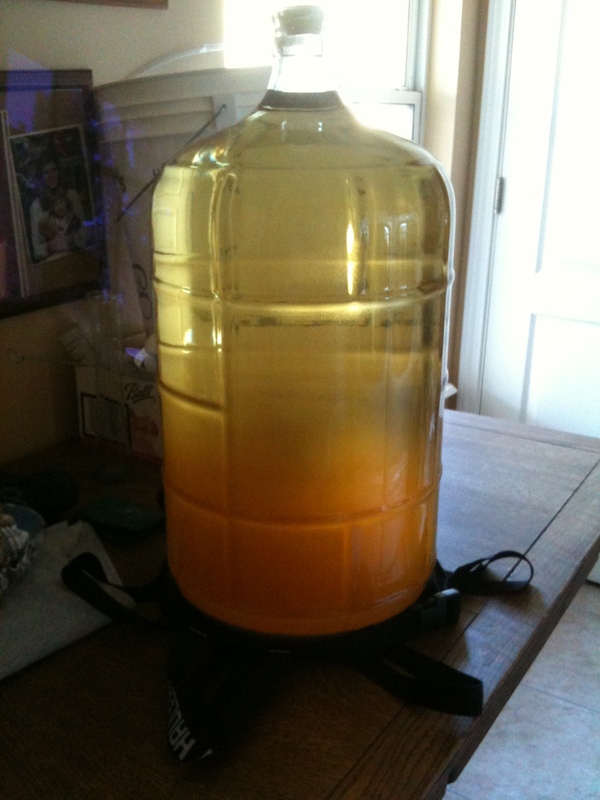 Everything has been mixed in, the carboy is topped off, and the bung is back on with the airlock. Another 14 days or so, and hopefully the wine will have cleared appropriately and we’ll be able to bottle into 375mL bottles, cork them, and put them away for a bit. The lager we did previously is aging nicely: we popped open a bottle to look it over, and it’s getting there. Mom drank her half, and the other half went into the shrimp we were boiling. The next batch of beer, to be started next week, will be a honey weizen. We’ll also be doing more wine, as my brother has requested a batch of strawberry wine. What better time for that than spring, when the berries are freshest?